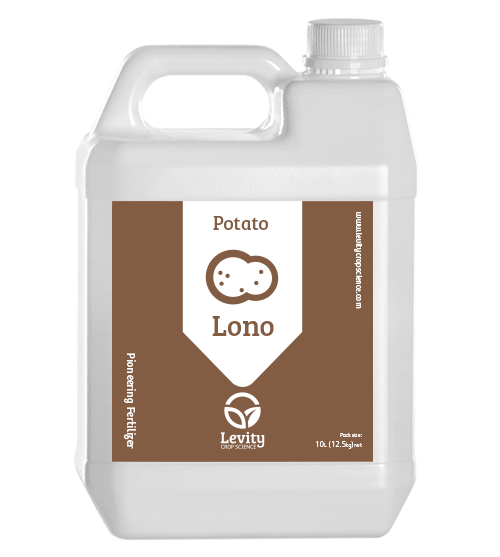 Lono for Potato* is a smart fertiliser that focuses the plants growth on tubers, by supplying nitrogen in a form that encourages reproductive growth. Lono uses Levity’s LimiN chemistry to hold nitrogen in the amine form, and also contains calcium and important micronutrients. Applied in low doses through the season Lono lifts tuber numbers and improves grading, skin finish and quality. Lono helps potato crops maintain growth during periods of stress, safeguarding yield. Key benefits: Increased tuber number, improved skin finish, more even size distribution, improved growth during stress. *Marketed as TouCaN in Netherlands. Damu for Potato bulking is designed to increase the size, uniformity weight and dry matter content of potatoes ahead of harvest. Damu works by encouraging movement of photosynthates in the leaves down into tubers, pushing resource into the tubers. Key benefits: Increased tuber size, improved uniformity, increased dry matter, higher yield.